I hope you’re ready to love the 5-Series! I went ahead and did another quick list for the middle luxury sedans (5-series, E-Class, A6, XF, CTS, GS, Q70, G80, and S90). I mostly wanted to point out how the GS F is nearly $13,000 overpriced for no discernable reason, that Jaguar is NOT a Porsche competitor anymore (they are the same segment as Cadillac), and most of all that BMW has absolutely lost their damn mind! Check this out. Note that all information is from today on each automaker’s US websites (even if the 2018 models are on dealer lots). If 0-60 mph is claimed on site by the manufacturer then I placed the fastest claim possible with that drivetrain. Pricing is always the lowest available price to obtain that engine. This means that the price and 0-60 mph claims are not connected. Keep in mind these horsepower figures compared to their 0-60 mph claims because I think BMW switched to advertising wheel horsepower in second and third gears. So far we have 450 hp, 396 hp, and 335 hp all running 4.4 to 4.7 second 0-60 mph times. So the 340 hp Jaguar XF is an even better value than the NA V6 Caddy, not to mention the starting prices for a 4-cyl Benz or Bimmer. 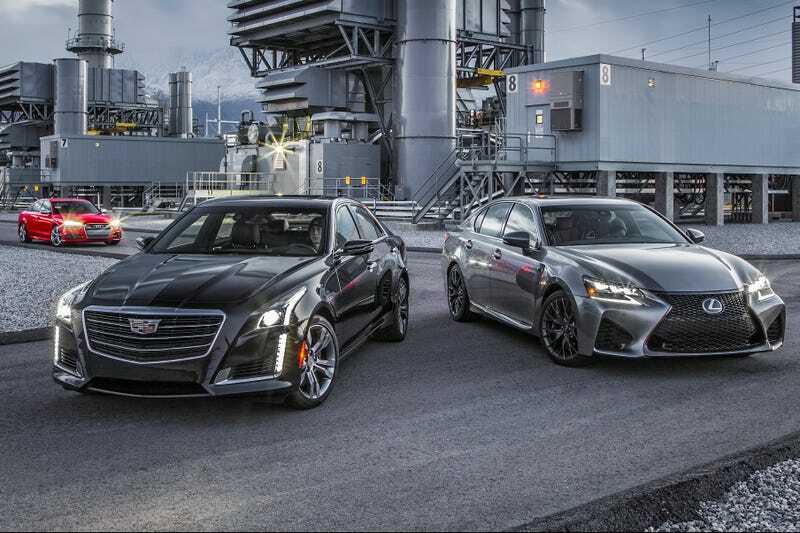 Oh, don’t forget to compare the CTS-V to the M550i. I have no clue why the GS F isn’t offered as a $70,000 sedan. Maybe Lexus is enjoying the benefits of high residual values on leases to the point where the GS F can be up charged $13,000 and still run the same leasing as a $70,000 competitor. Someone check that for me. Yeah, you noticed that complete drop off once we hit Infiniti, Genesis, and Volvo too? Kind of tells you the amount of work still needed. Good on Volvo for NOT being in the same segment as Acura or Lincoln! This also backs up what I have been saying about Genesis really only impacts Infiniti and when you look at the product development and launch speed of Infiniti vs Genesis you start to see why the new Korean brand was launched when it was. I’ll update this when all the 2018 models hit the US websites so that you all can witness how quickly these brands are evolving. I personally believe you can learn a lot about a brand by what they do in this segment.